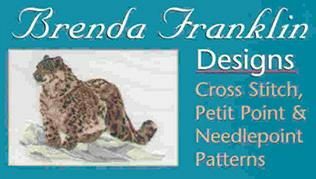 Brenda Franklin, a realist artist in many different media, started designing counted needlework patterns when a client asked for a custom design. Always ready to try something different, Brenda took on the challenge and fell in love with a new form of expressing her passion for nature and animals. Some of her favourite personal drawings and paintings have been turned into beautiful counted needlework patterns for you to enjoy. Beginner and experienced needle workers have both commented on their delight in seeing the artistic puzzle develop and come to life as they stitch. Brenda hopes that you also will find hours of enjoyment when stitching one of her designs. As a needle work teacher . . .
Brenda Franklin has taught through the local continuing education program and has also lectured and taught for various guilds and organizations. Her classes cover a wide variety of topics related to arts and crafts but focuses mainly on needle arts, beaded knits and beadwork. All patterns are hand charted. These charts have been computer printed for consistency and readability. These patterns are not computer generated. 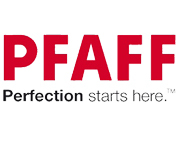 Designs are charted for any even weave fabric (the majority of patterns are full stitches with no backstitching required) and can be used for cross stitch and waste canvas, needle point and petit point, latch hook rugs and even bead point. Design requests and custom orders are accepted; however time for delivery will depend on the number of requests and orders that have been placed ahead of your request. Brenda Franklin’s bead stitch designs range from realistic to whimsical. The designs are available as patterns or kits. Brenda has beading supplies available as well. Brenda Franklin not only has beaded knit designs available but also three books that cover two different bead knitting techniques. Only basic knitting skills are required for these projects and the books included detailed color ‘how to’ photos to help the reader visualize each new technique. Beaded knit jewelry and accessories are quick portable projects that can be completed in an evening or weekend. The designs are available as patterns or kits and all the supplies for these projects are available as well. Volume 1, Swagged Bead Basics – Uses basic ‘cast on’ and the knit/garter stitch to create more than 20 different projects. Volume 2, Popped Bead Basics – Uses basic ‘cast on’ and knit/garter stitch as well and also the purl stitch to create at least 30 different projects. Volume 3, Glitz – Combines the techniques in volume 1 and 2 as well as introducing the reader to beaded knit sweaters and fancy beaded knit purses. Glitzy, sparkling beads are added to the designs to create a dramatic wearable for any occasion. There are more than 25 projects included in this volume. Brenda lives in the center of Southern Ontario, close to everything but in the middle of nowhere. Brenda has always been creative and at the young age of three, ‘decided that when she grew up she would be a famous artist’. Portrait work was her main focus and animal expression her dominant subject. 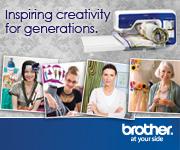 This led to requests for needlework designs, a website, distributors, dealers and patterns selling worldwide. She’s not sure whether being a designer or an artist are the same thing and fame for an artist generally happens after they’ve passed away, so Brenda would rather not be famous yet: she has too many exciting projects in the works. Brenda started selling her realistic paintings as a teenager. Her animal portraits and custom glass etching eventually led her to dog shows where she sold her products and met a cross-stitcher. The stitcher thought that Brenda’s realistic approach and her ability to capture personality would be ideal for a designer. Soon after, Brenda tried her hand at designing needle work patterns. Her hand charts quickly became popular with the dog show crowd and she realized that it might be helpful to learn how to stitch them. Yes, she was selling designs before she ever learned how to cross-stitch. While growing up, Brenda taught herself beadwork and learned how to knit from her brother. Brenda found that beads were ideal for expressing oneself in so many different ways; she still hasn't tried them all. She was designing jewelry as a teenager and never stopped. Brenda often says that if she was ever stuck on a deserted island, she would definitely want to have beads along with her because you can string them, weave with them, knit with them, stitch them, paint or sculpt with beads and trim with them. Okay, you can't eat them but with beads keeping you busy, who needs to eat? Years and more than 500 charts later, Brenda is still hand charting needlework patterns but has a selection of bead stitch and beaded knit designs available as well. It was inevitable that she would combine her love of knitting and beadwork and the result is portable, quick bead knitting projects. She has designs in various publications and has finished three ‘how to . . . beaded knits’ book. Teaching has been a part of Brenda’s life since back in her roller-skating days. She feels that passing on knowledge is the best way to keep that knowledge alive. She includes all the tricks and helpful hints she has learned through the years and doesn’t hold back. I have known Brenda's work for a long time. Her work is just Beautiful.